Running, jumping, tumbling, and creative play--it all happens here in our kid friendly, air conditioned facility. Each week our different themes will have your child exploring the wild wilderness, sailing the high seas or blasting off to new planets! They will be having so much fun they wont even notice they're building coordination skills as well as self-confidence. Join us for a summer of active fun! 3 hours of learning, socialization, and non-stop fun! 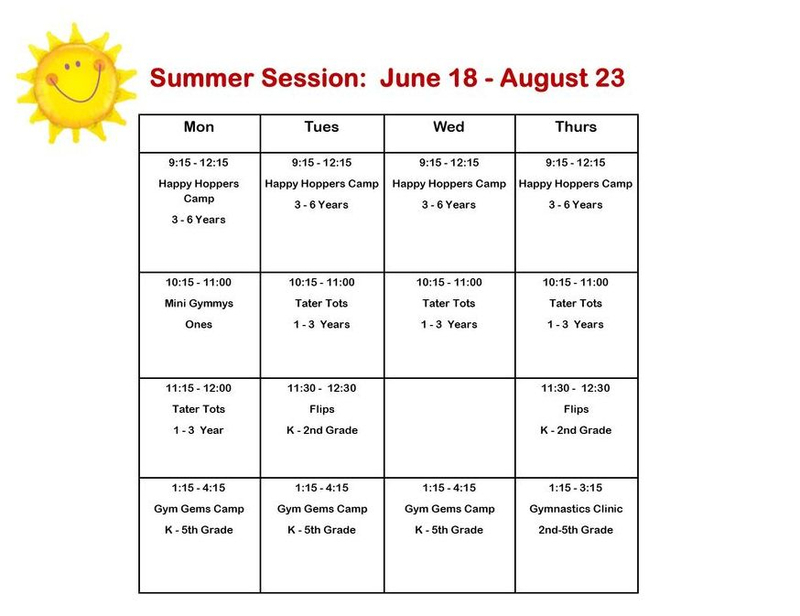 This camp includes 45 minutes of gymnastics instruction including motor development, body coordination, basic apparatus skills and games! Next, campers move into our classroom where activities include, art, creative play, story time, exploration and a delicious snack! The number one activity in our grade school camp is gym time! Each camp includes tumbling, apparatus skills, and games that encourage campers to develop new skills, as well as, self-esteem and self- confidence! We also offer art and science projects, creative play, outside activities and a snack! From drop in style toddler classes- to advanced gymnastics clinics, we offer it all during the summer! Summer means flexibility- sign up for classes and clinics that best fit your schedule! There is no minimum class requirement, come see us as much (or as little) as you wish! Our summer classes and camps are designed to accommodate your busy summer schedule. Our flexible schedule is easy and convenient, however it requires a bit of extra paperwork to keep everyone straight on dates. To make the process easier, we have designed 3 separate registration forms for summer. 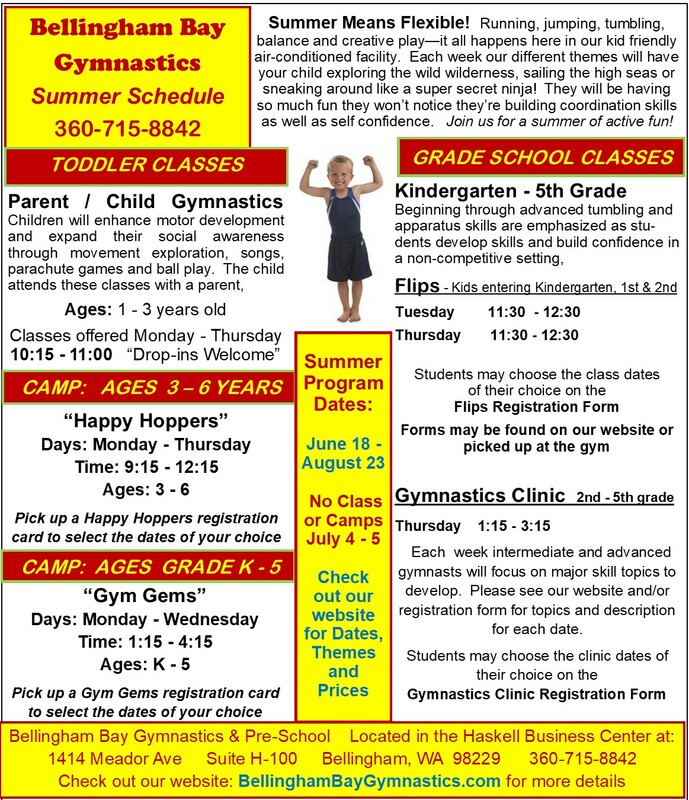 There is a form for both our "Happy Hoppers" camp and "Gym Gems" camp, as well as, all grade school gymnastics classes/clinics. If you have more than one child, please fill a form out for each one. To register for camps, please circle the dates on the appropriate camp calendar you would like your child to attend. If a class or camp becomes full, you will be notified and placed on the waiting list. Payment is due each week for that week’s camps and / or classes. You may lose your spot if your payment is late. Sibling Discount - There is a one dollar discount per class for each sibling enrolled. Additional, there is a five dollar discount per camp for each additional sibling enrolled. There is also a $35 annual membership fee that must be paid prior to enrollment in camps or classes. If you are registered for a class or camp and are unable to attend, notice must be made within 48 hours for a credit. Our summer program is dependent on a full class or camp each day. If you fail to cancel a scheduled class, and we are unable to fill your space from the waiting list, your payment is forfeited. If you earn a credit during the summer, it must be used during the summer session. Summer credits are not transferable to Fall Classes. Please have your child(ren) wear loose comfortable clothing. Girls may wear leotards. No socks or tights with feet, please. Jewelry is not permitted. Bellingham Bay Gymnastics is not responsible for lost or stolen items.